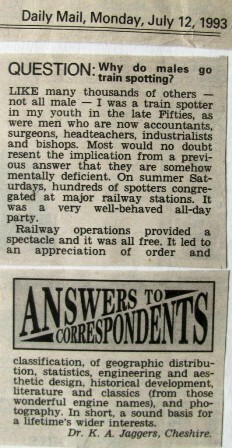 Some years ago the Daily Mail newspaper printed a reader's query in its "Answers to Correspondents" column: "Why do males go trainspotting?" Replies were published from various amateur (or perhaps professional?) 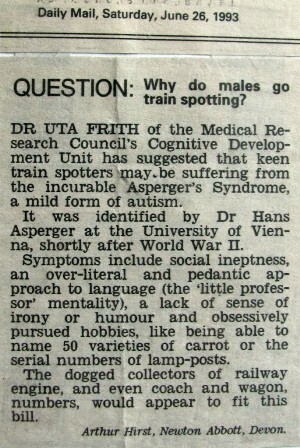 psychoanalysts, which generally implied that participants were somehow mentally deficient! This was apparently the only positive reply they received, and had the effect of bringing the correspond-ence there to an abrupt close! Another, and quite unexpected effect was that my reply then appeared in most of the mainstream transport journals over the next few months, with generally flattering editorial comment, and was still occasionally mentioned some 10 years later. Presumably this was my 15 minutes of fame!